THE IRRESisTIBLE AND INSATIABLE EXPERIENCE . . .
Mr. Brahmananda Panda was a distinguished parliamentarian from Orissa (a state in East India) who served as a Member of Parliament in New Delhi for ten years (1968-78). Once a disbeliever, He turned into a staunch devotee after he was drawn to Sai through mysterious circumstances in 1966. Since then He made several trips to His Divine Presence and in the coming years became a valuable instrument in His Hands. He served for several years as the first State President of Sri Sathya Sai Seva Organisations, Orissa, till he breathed his last in 1996. He was an excellent writer and orator. The current article is an edited extract from his book “Raso Vai Shah (Sweetness He Alone Is)”. We will continue this with another extract in the next issue of H2H. Can I ever forget the priceless beatific moments I was privileged to spend in the Lord’s company? It was the year in 1976. I visited Puttaparthi during Guru Purnima to attend an All-India State Presidents’ Meet/Convention. Guru Purnima was on July 11 and I arrived in Prasanthi Nilayam on the 10th afternoon. 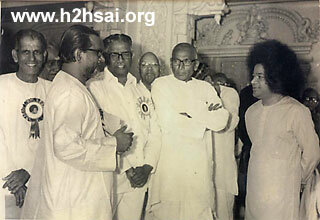 That evening at five, Dr. Bhagavantam presided over a meeting of State Presidents when Baba walked in while our discussions were going on, and blessed us. 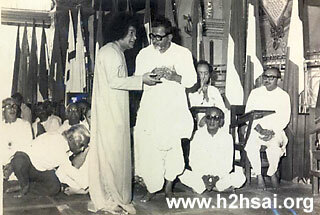 The next day, Baba inaugurated the Easwaramma High School, and Sai Nagar, a colony for Harijans, which was built by the Sri Sathya Sai Central Trust with the blessings of Baba. 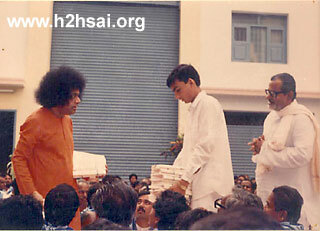 Baba then distributed to each family, clothes and some essential utensils with His own hands. On July 12, Baba allowed me to take padanamaskar, and on 13th, He created vibhuti for me. I was in the seventh heaven, reveling in every moment of the Divine Attention. ‘What more could I ask for,’ I thought to myself. So when Baba summoned me in the Mandir, a while later, little did I know that I was in for a bumper windfall of Grace! How can I adequately describe what I felt in those timeless moments? If the very Deity of Sleep would have come and offered me all the wealth of heaven for a wink of repose, I would have refused without a thought. The One for whom man spends life after life in tapas (penance) was sitting close to me! The more I was afraid of touching Him, the more He rubbed Himself against me! 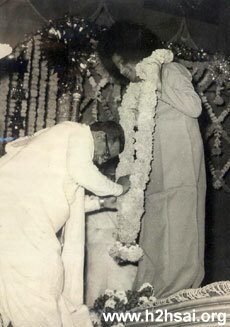 Sometimes, in the pretext of telling something to Dr. Bhagavantam, Baba bent across me so much that my face was completely covered by His hair! And the fragrance that emanated from His being would put even rose petals to shame. To breathe in that tender fragrance was to breathe in joy. "Lord, whenever You permit," I replied. "Come, let's go to Brindavan. From there, you go back to Delhi. I am starting tomorrow early morning. You come behind Me." "Yes, Lord," I said, ecstatic. I took padanamaskar and came out, heart bubbling with joy. That night, Mr. Kutumba Rao came to my room and asked me to be ready with clothes for three days and present myself promptly in front of the Mandir by Suprabhatam (morning prayers) time. My mind was in a state of indescribable joy and anxiety. The previous night, I hadn’t had a wink of sleep due to high blood pressure. If sleep overcame me this night, and I failed to wake up at 3 a.m., then I could not get ready in time. Baba's car would not wait for me even a second. Whom could I trust to wake me up at 3 a.m.? The only way out of this quagmire was to stay awake throughout the night. Knowing that I ran a great risk of falling asleep in the room, I decided to keep awake by walking up and down the corridor! Thus, next morning, when Omkar began in the Bhajan Hall, I was standing before the temple with a small briefcase. My mind was very fresh, but my eyes were burning fiercely out of exhaustion. In the cool morning breeze, I felt if I just lie down somewhere, I would fall 'dead asleep'. Baba came out by the end of Omkar, and stood on the verandah in the subdued light for a minute or two. In the morning’s quiet and mellow light, He radiated a soft, heavenly aura. Awed and inspired, my heart was filled with love and prayer. Baba sat in the back seat of the car. 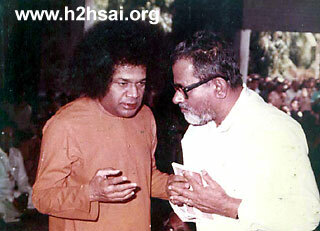 I sat next to Him, with Dr. Bhagavantam on my other side. On the front seat sat Mr. Chakravarthy, the then Collector of Anantapur District (presently Secretary of Prashanti Nilayam ashram). How can I adequately describe what I felt in those timeless moments? If the very Deity of Sleep would have come and offered me all the wealth of heaven for a wink of repose, I would have refused without a thought. The One for whom man spends life after life in tapas (penance) was sitting close to me! The more I was afraid of touching Him, the more He rubbed Himself against me! 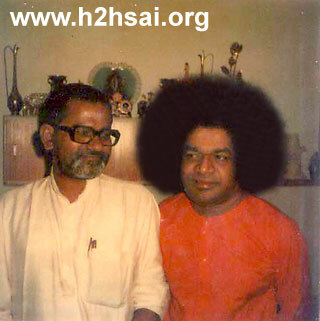 Sometimes, in the pretext of telling something to Dr. Bhagavantam, Baba bent across me so much that my face was completely covered by His hair! And the fragrance that emanated from His being would put even rose petals to shame. To breathe in that tender fragrance was to breathe in joy. At about seven in the morning, our car took a diversion and stopped in an open area of the roadside jungle. The vehicle behind us also stopped there. Breakfast was taken out of that vehicle. Puri, idli, vada, curry and chutney. To top it all, there was coffee in a big flask. Baba took just a little, but fed us till our stomachs were full. Then, once we resumed the journey, He spoke of spiritual as well as worldly matters. He stressed on the necessity of having deep faith in God which alone could confer peace and joy. Now and then, He even made us laugh with His inimitable humour. We arrived in Brindavan at 8 o'clock. Baba walked upstairs to His room, while the rest of us stayed down. The students of Baba's college served the guests. By the time I refreshed myself, a boy was waiting for me with a cup of coffee. He told me, "You must be tired. I have made the bed. You may take rest." This was like elixir to my ears! I was forcing myself to keep my eyelids open at that time. As soon as I lay down on the bed, I fell asleep. I was in such deep slumber that I did not even hear the call for lunch. I later heard that Baba had given instructions not to wake me up. "He was sleepless for two nights. Don't wake him. Let him sleep," Baba had said. I got up at four in the afternoon, and then the call for coffee came. I went up to Swami. He asked me, "What, did you sleep enough?" "Lord, I have not known such deep sleep for many days" I replied. Baba said, "Your blood pressure denied you sleep one night. My car hindered you the next night. So I did not wake you up for lunch." What a revelation of His infinite compassion! I came down after tiffin and coffee. 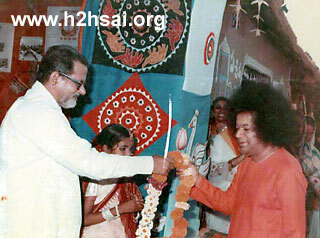 The same evening Baba inaugurated the new hostel for students. We all had our dinner there with Him. The Lord takes all care of the devotee, gives him the rare joy of personal contact, and gradually makes him desireless. When the Lord comes to the devotee, He is no more Shiva, the Lord of Kailash, or Vishnu, the Lord of Vaikuntha, or even Parambrahma, He becomes the devotee’s very own, as mother, father, friend, companion. On July 15, before I got up from my bed, a boy was ready with coffee. It was not yet six. The call for breakfast came at about 8 a.m. The students were serving Swami and us guests. Baba probably took only one idli and one vada. 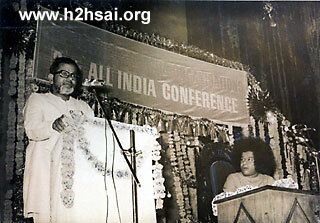 Dr. Bhagavantam too had only a few morsels of food. But Mr. Chakravarthy, Swami Karunyananda and I did not stop at anything! We next saw Baba for lunch at 1 p.m. He sat at a special table, while we sat at another. Rice, curry and all else put together, He might have barely eaten three tablespoonfuls of food. Then He came again to coax us to eat more, just like a mother. He thumped my back and said, "Pah! How will you get fish here? Take care. I will tell the Rajmata." "Lord,” I said, “In our state, people cook fish with such spices." Swami laughed and said, "Tastes differ from place to place. I am happy if you eat well." My purpose of narrating all this is to tell the reader the endless depth of Avatar's leela. When the Nameless and Formless assumes a name and a form, and descends amongst us, He comes down to the human level in such a way that the sweetness of His intimate Love creates an insatiable thirst in the human heart.The Lord of sweetness (rasa) fills the yearning heart (rasika) with incomparable sweetness. He takes all care of the devotee, gives him the rare joy of personal contact, and gradually makes him desireless. When the Lord comes to the devotee, He is no more Shiva, the Lord of Kailash, or Vishnu, the Lord of Vaikuntha, or even Parambrahma, He becomes the devotee’s very own, as mother, father, friend, companion. Dear Reader, did this article inspire you in any way? Would you like more such stories from devotees who have been touched by His Love? Please write to us at [email protected] mentioning your name and country. Thank you for your time.